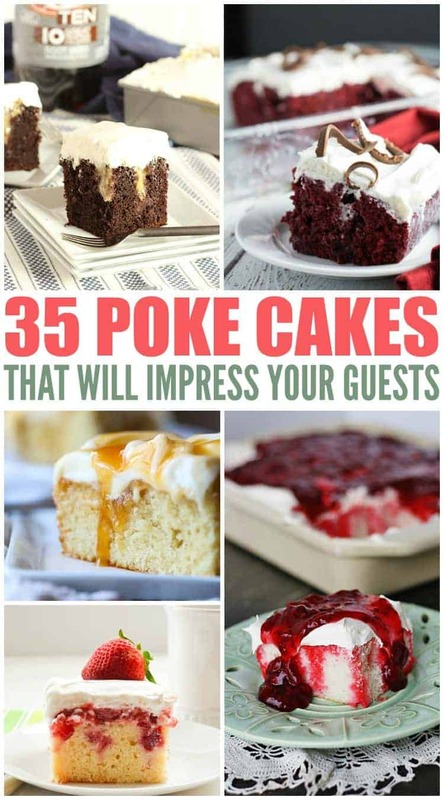 Check out this Roundup of 35+ Poke Cake Recipes! If you’ve never hear of a poke cake, it’s rather simple and true to it’s name. It is a cake that you poke holes in after baking (often with the end of a wooden spoon) and then fill the holes with something amazing. I have shared quite a few poke cakes with you here on my blog. 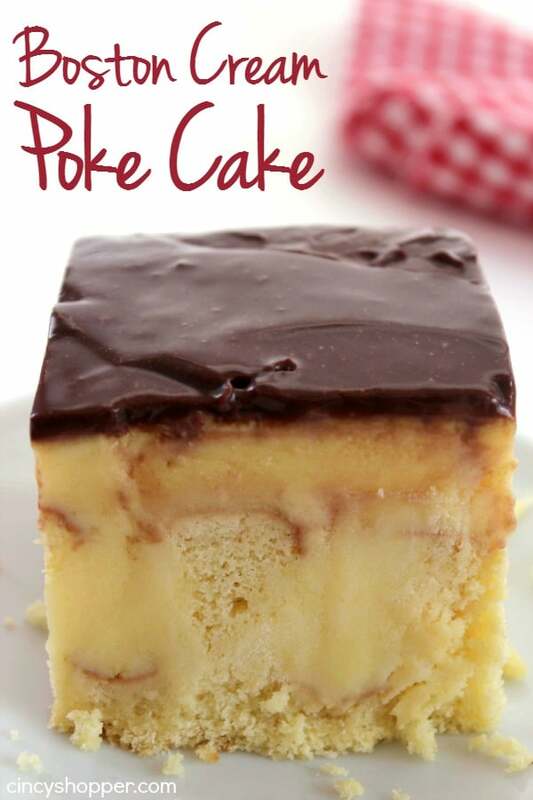 Here are just a couple of my favorite poke cake recipes that can be found here on my blog..
Boston Cream Poke Cake – all the flavors of a Boston Cream Pie … right inside a poke cake! Caramel Apple Poke Cake – caramel and apples! Makes for a perfect fall dessert! Pumpkin Caramel Poke Cake – an amazing fall dessert. You will find it easy to make since it starts with a boxed cake mix. We added in lots of caramel and a cream cheese whipped topping to make it extra delicious. Perfect for your Thanksgiving dessert. 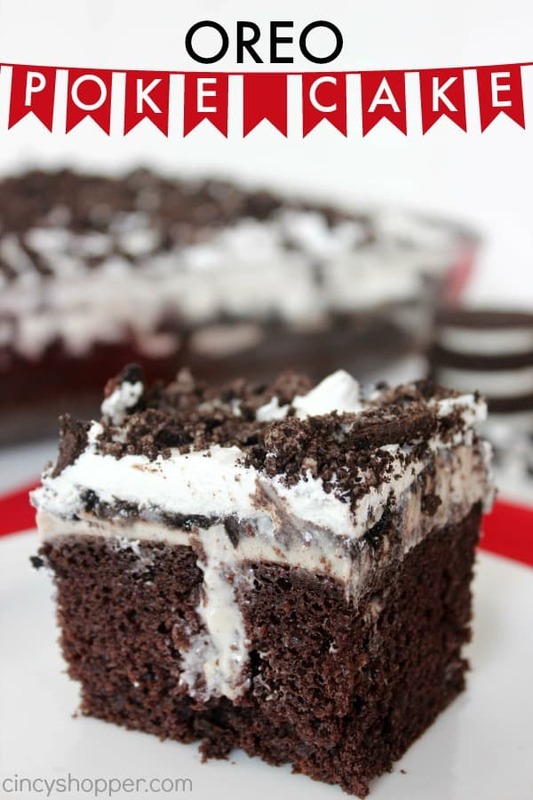 OREO Poke Cake – This one is definitely my hubby’s favorite. Tastes so much like a high end dessrt. 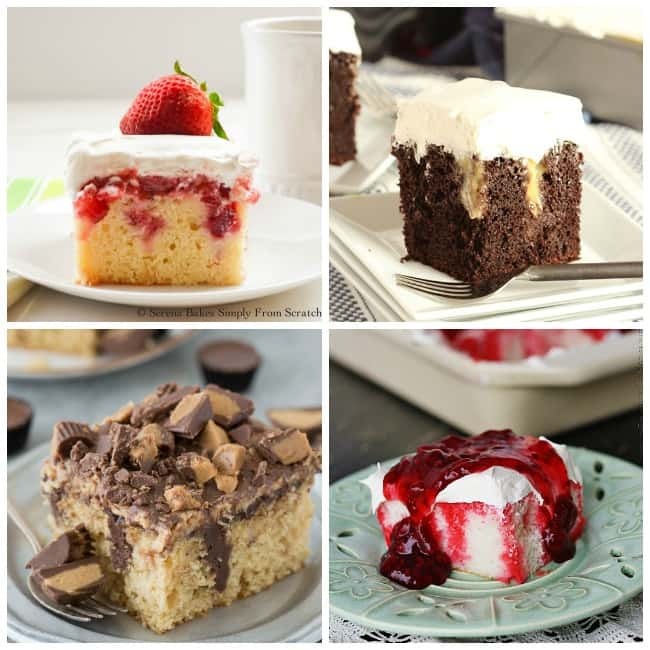 The following 35 Poke Cake recipes are from some of my favorite blogs. These are all on my list to try this year. I’m just trying to decide which one to make first! 1- This Strawberry Shortcake Poke Cake is made of a yellow lemon buttermilk cake for the base and is filled with fresh strawberry puree. 2- This Banana Pudding Poke Cake is a fun twist on traditional banana pudding. 3- Looking for a more adult option? Try this Mojito Poke Cake! 5- Oh. My. Goodness. Ice Cream Poke Cake is literally a cake filled with ice cream! 6- Topped with pecans and filled with delicious pistachio pudding, Pistachio Poke Cake is simple yet irresistible. 8- Looking for a real simple poke cake? Red Velvet Poke Cake is a box mix and the filing is condensed milk. 9- Candy bar lover? Try this Snickers Poke Cake. 10- This Raspberry Dream Poke Cake can be altered for many different fruit filled toppings! 11- What could be better than a root beer float? How about a Root Beer Float Poke Cake. 12- If you are a Reese’s lover, you will love this Peanut Butter Chocolate Poke Cake. 13- This Chocolate Mint Poke Cake promises to taste just like an Andes mint. 14- The best way to eat Champagne Cherry Poke Cake, is with a cherry on top! 15- Topped with shredded coconut, this Mango Coconut Poke Cake takes less than a half an hour to make. 16- Making your first poke cake? 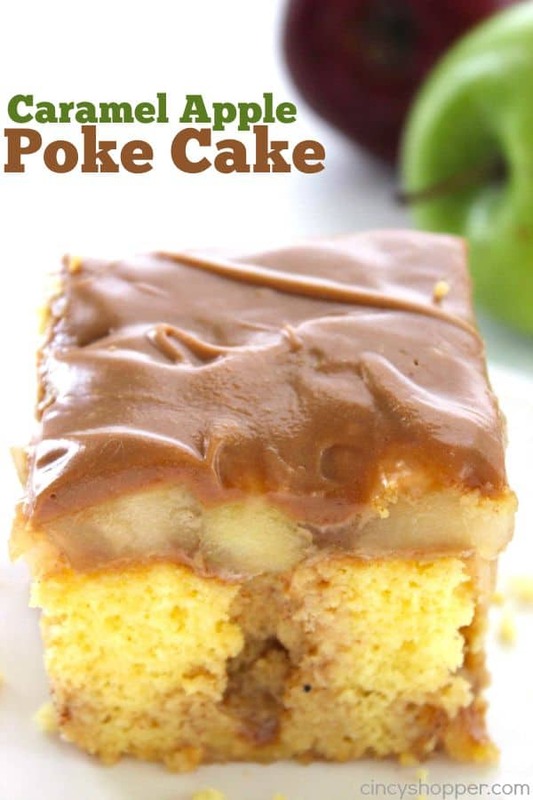 Try this Easy Caramel Poke Cake recipe. 18- Or if you have chocolate loving guests, make this Triple Chocolate Poke Cake. 19- This Cherry Chocolate Chip Poke Cake tastes just like an ice cream sundae! 20- This Peanut Butter & Jelly Poke Cake is like your favorite childhood snack, but better. 21- You can serve this Cream Of Coconut Poke Cake right from the pan you baked it in. 22- Cherry pie lover? This Black Forest Poke Cake is topped with cherry pie filling. 23- If you need a gluten-free option, try this Peanut Butter & Chocolate Turtle Poke Cake. 24- Pumpkin spice doesn’t have to be fall exclusive. You can make this Pumpkin Spice Poke Cake any time of the year. 25- The caramel drizzle and toffee bits make this Caramel Apple Poke Cake irresistible. 26-Topped with a fluffy cheesecake frosting, this Pumpkin Chocolate Chip Poke Cake is a real crowd pleaser. 27- You don’t need a campfire to make this S’mores Poke Cake. 28- This Snickerdoodle Poke Cake is extra fancy. It is two layers tall. 29- Delicious almond and lemon flavors merge beautifully in this Almond Lemon Poke Cake. 30- Do you love coffee? Then you have to try this Mocha Poke Cake. 31- This Blackberry & White Chocolate Poke Cake is packed with blackberry syrup and topped with a rich cream cheese and blackberry frosting. 32- If you love strawberry shortcake, you will love this Strawberry Jello Poke Cake. 33- Pumpkin season is over. 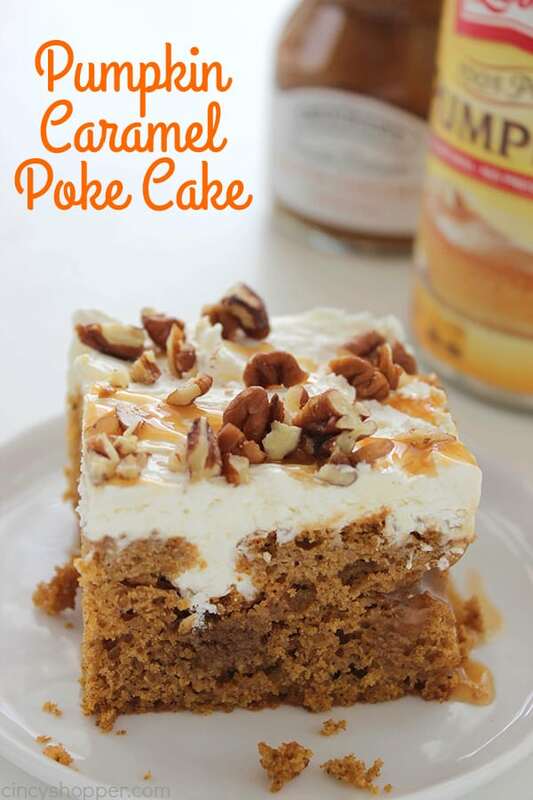 But you can make Pumpkin Caramel Poke Cake year round! 34- Want a poke cake that has caramel, pecans and chocolate. Try this Turtle Chocolate Poke Cake. 35- This Kahula Chocolate Poke Cake is a deliciously boozy dessert that will get any party started! Do you have a favorite Poke Cake that you make frequently?